Let me start out by saying I LOVE new products. I will try anything that has to do with paint, upholstery, or crafts. I use what I like, not what everyone else uses. So If I like a product, I am going to use it. I use multiple different paints for furniture and I love playing with new finishes and techniques. The newest one I have fallen in love with is Amy Howard Home One Step Paint. No priming, sanding, or waxing involved, unless you want to add a dark wax to age it. It's so nice to skip all that timely prep work! When I opened it, it had to be stirred for a few minutes, but after that it was ready to go! I love grays, so it was the perfect color. 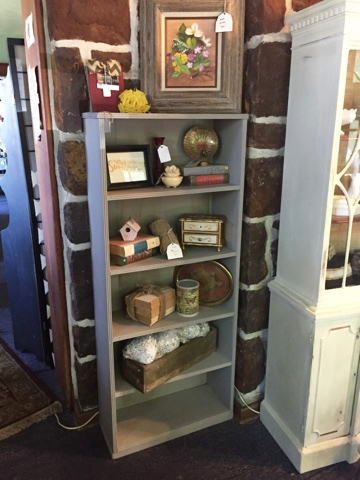 I had this bookshelf that was previously painted coral, and I wanted something more neutral. Gray fits into more color schemes and styles then coral does, although coral is a beautiful color. I put two coats of paint on, and I LOVED the color. The paint took no time at all to dry and felt great after it dried. 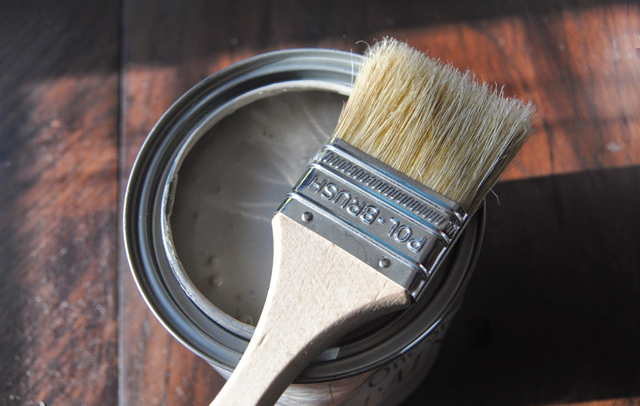 I am a touchy geeky kind of blogger, so I dislike paint that is gritty. Although the color looked great, I felt it needed a 'lil something extra. I added some stripes in the back beadboard by using the dark wax. It was pretty easy to use as well. I couldn't get a great picture of how it looked though. I'm still working on my photography skills! I took this last picture to show how it looks in my space. Hopefully it will find a new home in someone's home soon! Have you ever used Amy Howard before? What did you like about it? The stripe is totally perfect! Adds great dimension!